Hunter Callanan is the Communications & Workforce Specialist for North Iowa Corridor. She leads the organization’s efforts in marketing, communications, and workforce development initiatives to help our community to attract and retain jobs and a talented workforce for the region. She is also responsible for the development and management of the marketing strategy to promote development initiatives, resources, and projects, and serves as the communications manager for the organization’s activities and marketing for all media formats. Coordination with other agencies and partners on workforce development issues and the creation of a workforce retention and expansion program are a primary focus. Hunter was born and raised in Mason City. She is a graduate of Loras College with a degree in Public Relations. 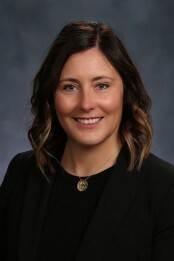 She spent 10 years in marketing at CL Tel and most recently worked for North Iowa Area Community College on a State of Iowa grant that connects students, educators, and business through relevant, work-based learning activities. Hunter is passionate about shaping our future workforce to the needs of our region, as well promoting our regions assets to those near and far.